Realtek PCI RTL-81xx LAN Drivers Build Version 10032_01222019 WHQL. 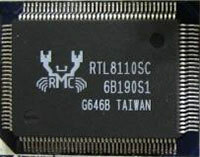 - New version driver package for network chip Realtek RTL8111B, RTL8168B, RTL8111, RTL8168 etc. Supported OS: Windows XP, Vista, Windows 7, Windows 8/8.1, Windows 10 - 32/64 bit.